For current report and more archived Minnesota Fishing Reports, drop your bait in the water here. 3-30-09 With the lack of fishermen on the lake and in the store it seems most have given up the ice season and are waiting for warm weather and open water its hard for me to understand with such nice conditions why but most must be tired of winter. We have been trying to take advantage of the nice weather and making the most of what's left of our ice season. We have been using ATV.s to get to our spots but a few crazy guys are still driving out. 2-24-09 Now that the inland Pike and Walleye season has come to a close we have started putting a lot more effort into finding some nice sized Perch. The ice conditions are so good right now that getting around cruising for Perch is unbelievable after fighting snow and slush all winter it seems easy. With the rough conditions most of the winter we are finding most of the ice has not been touched all winter. I've heard some good reports coming from the deeper water but we have been sticking to the shore line breaks 15 to 20 feet and have been finding nice sized fish. Drilling lots of holes and keeping on the move is putting fish in the bucket for us if I don't get a bite in a couple minutes its on to the next hole sometimes we only get one or two nice fish per hole and sometimes none for several holes. 2-12-09 Man did things change in just a few days the rain we had in the last few days really knocked the snow pack down in a few days you should have know problem getting around with pickups or ATV.s. I think we will stick with snowmobiles or ATV.s through the weekend till all the slop is froze solid. The few that did fish in rain said the Crappie were really biting and I look for some really good reports as the guys start getting out this weekend with all the fresh water seeping through can really get the fish on a feeding frenzy. And with the easy mobility finding fish will be a lot easier making the reports and catch rate a lot better. 2-2-09 Well in the last week we went from one extreme to another from fishing Perch on Winnie with a temp of -20 below to 40 above and fishing Trout on Lake Superior north of Bayfield Wisconsin maybe that guy that said "life is better on ice" knew what he was talking about if not we've been having fun. For the Perch fishing we went out of Sunset resort they have a nice road that gives you a few different choices in the bay this has probably been one of the most reliable places to catch Perch if you want to drive to you're spot this winter but some times we've had to sort a lot of little ones to get our keepers. There is a good Perch bite also going on on the west side the guys that have been heading over there have been going out of High Banks resort but you need a snowmobile to get the last few miles but the little extra effort has been well worth it. For the Trout we took snowmobile out eight miles around the islands the ride out and back was very cool with the island having big cliffs with big pine trees hanging off them I can see why so many people come to this area in the summer and take ferry rides around the islands. Trout fishing is not for everyone because its not usually a numbers kinda deal, its more like Musky fishing where you have lots of hours per. fish so it feels really good to get you're hand on one. 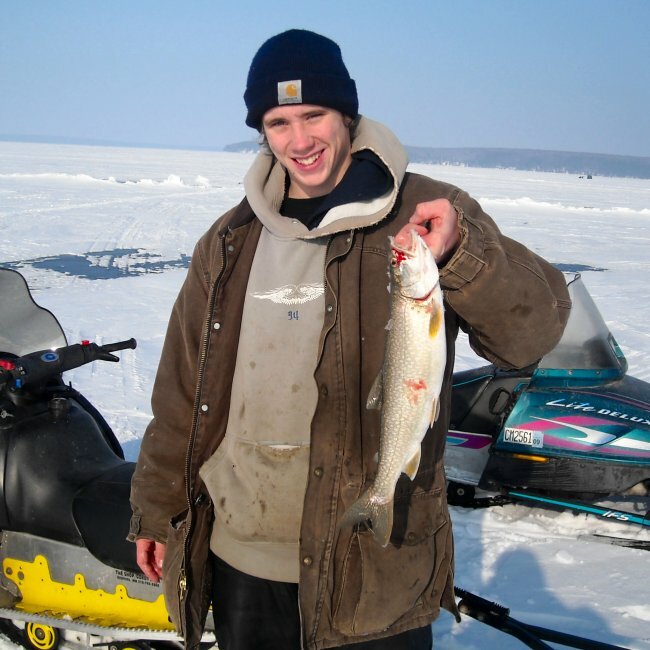 We used big jigs tipped with Herring ,Airplane jigs, Spoons and big Tubes and were able to ice three beautiful lake Trout. I'd like to thank my friends for inviting us along even though Chester and I have been Trout fishing before this one was perty awesome. 1-20-09 This weekend we decided to give Winnie a shot and check out the conditions out on the High Banks Resort road thinking this would be our best shot on our quest for some big Pike. One of the many roads got us within walking distance of a small hump that we have did good in the past on so we set a base camp there and took turns punching holes. It seemed to take a while for things to settle down before we started catching fish but then it was a nice mix of Walleye, Perch and Pike . Although we had two tip-up set at all times most of the Pike were caught using a small spoon and Shiner along with the Perch and Walleye. I would still suggest bringing a snowmobile because the road system limits you so much there is a lot of structure that has not seen any fishermen this winter leaving lots of fish just waiting for a shiny bait and minnow combo. There was some really good reports of limits of Perch caught last week off the Bowens flat area. And some nice Northern Pike speared along the old river channel and also up in Third River. 12-26-08 - Merry Christmas everyone, Chester, Mary and I spent our Christmas after noon on Red Lake man what a beautiful road system them folks have nice wide roads with many push offs for fishermen to get off the side away from the main road traffic. Most of the fish we caught were in the protected slot of " 17 to 26" but managed a couple eaters to bring home Chester also caught a nice Pike that was in the protected slot that was quickly released. Locally the only road system we have for pickups and houses so far is Denny's Resort on the south end of Winnie hopefully in the next couple of weeks we will get a few more. There have also been many guys taking snowmobiles out of the Birches public landing and the reports have been good. 12-17-08 Chester and I got out on Sat. before the big storm and did a little Perch fishing we found a good bite on the first break in 14 feet of water. As always when there are lots of Perch around there are a few Northern for excitement as well we stayed till dark hoping to catch a Walleye but none showed up. We found about a foot of ice on the small lake we fished which seems to be the average I have been hearing from most fishermen. I've been getting lots of calls wondering about driving out and the only places I know of plowed roads so far are Lake Of The Woods and Red Lake. We got about a foot of snow on Sunday so I don't look for a lot of local trucks on the ice till after Christmas. We have put the ATV away for the winter and will be digging out the snowmobiles with all the snow and drifting I think ATVs are going to have some trouble getting around. I see some of the smaller lakes are getting a little yellow around the edges so there must be a little flooding going on already. Hope to see ya on the ice! Not huge, but great eating size Crappies are hitting right now and the ice conditions are great. Chester Powell, putting on an ice fishing clinic. 3-9-09 We didn't catch a pile of anything, but we got a few of everything. Not bad when you're looking for a fish fry. In spite of deep snow and a layer of slush, plowed roads on Winnie get you within walking distance of some decent ice fishing. Red Lake is producing some nice Walleye right now. Roads are open on Lake Winnie this weekend for folks who've been waiting for a chance to head out there too.